I had never never imagined even in my wildest dreams that I would see samosas (traditional Indian pastry, triangular in shape and filled with spicy mince meat) in an area renowned for lobsters, shrimps and other seafood delicacies in New Brunswick. This is not Toronto or Vancouver, which has a high ethnic population and hence would have great demand for samosas. Surprising as it may seem, residents of Fredericton, Saint John and Moncton, three of the major cities of New Brunswick, have a huge appetite for samosas. Thanks to a Mrs. Patel who initially introduced samosas in New Brunswick. One should thank Mrs. Bena Patel, a Fredericton resident, who started the samosa business, making it a popular item at the Boyce Farmers’ Market, a huge social event where residents crowd to chat, catch up with each other and admire the local produce. Patel and a rival Samosa Delite were so successful that other vendors complained about the endless queues for the warm, crispy, spicy Indian delicacy. The demand for samosas was so much that the organizers had to ask samosa vendors to relocate in the market’s parking lot. Since then, Mrs. Patel has moved on, but her samosa legacy has stayed behind, haunting New Brunswick residents. Other cities have stuck to cheese steak sandwiches, bagels or pastries, but for many in the New Brunswick capital it just wasn’t a real Saturday until they endured a long lineup at the Boyce Farmers’ Market for a samosa. In 1990, Samosa Delight, a family owned business, was founded, providing fresh chicken, beef, veggie, turkey, lamb, cheese etc. The meat used is supplied from local butchers. One can pick from “extra hot veg” or “regular chicken.” Samosa Delight products are available in over 80 percent of the local convenience stores in Fredericton. Residents have supplies at their disposal throughout the year. In 2011, Samosa Delight was awarded the best appetizer in Fredericton. Despite all the fuss about samosas, my favourite New Brunswicken dish happens to be lobster. In the beginning, lobster was a staple food for local people in the Maritimes and lobsters were so unappreciated that they were used as fertilizer in the fields. Today, with the opening of lobster processing facilities and transportation facilities, lobsters have become a sought-after item on dinner tables locally, across Canada and beyond Canada. Driving from Fredericton to Moncton, we found the area littered with lobster shops. Lobsters can be bought at shops and fisheries all along the northeast and southeast shoreline in New Brunswick. Shediac, population 6,053, boasts as the “Lobster Capital of the World” and hosts an annual festival every July promoting lobster industry. Established in 1949, Shediac’s premier event draws tourists from all over the world to feast on succulent lobster and soak up Acadian and Maritime culture. Every night during the festival, 10 volunteers are chosen from the crowd to break down and eat three lobsters with their bare hands as fast as they can. The “World’s Largest Lobster” is displayed at the western entrance to the town. My wife, who has cultivated a taste for lobster thermidor while living in England, always complained about its unavailability in most Calgary restaurants. According to Wikipedia, lobster thermidor is a French dish consisting of creamy mixture of cooked lobster meat, egg yolks and brandy stuffed into a lobster shell. She was pleasantly surprised to find her culinary delight so readily available in New Brunswick and devoured it whenever she could. 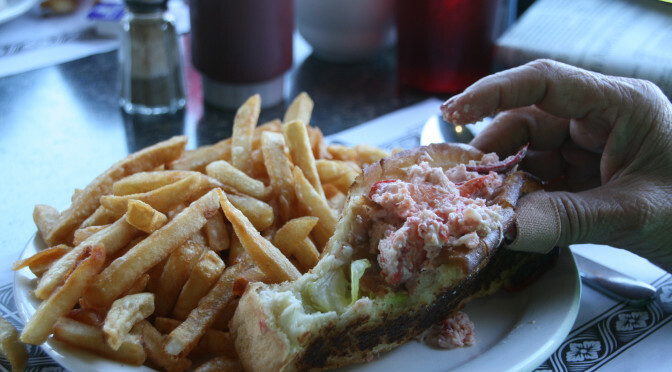 For a quick lunchtime snack, I used to order lobster rolls – lobster meat stuffed in a bun – and a bowl of clam chowder. That’s not the end of the lobster story. Visitors to New Brunswick are allowed to take lobsters packaged in special iceboxes home by air. We took advantage of the facility to take home a dozen lobsters. A familiar sight at the Moncton airport, our last stop, was passengers carrying iceboxes printed in big red letters: Lobsters.